For our planning (temp. ): see the "Italy" page in "Logboek Italië"
19.06.08 From Porto Turistico di Roma-Ostia to Nettuno. 27 NM, wind NW 2-3. We leave at 7 a.m. for a rather monotonous trip; there is a unpleasant little swell from the W - the last days were very windy, we had also rain and thunderstorms, so we have been delayed - but around 11 a.m. the swell disappears gradually. At 12 o'clock we enter Anzio but they have no visitors berths and the quay is not free due the works in Nettuno. 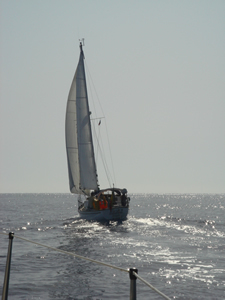 The anchorage is windy: the NW-ly wind is diverted at Cape Anzio. 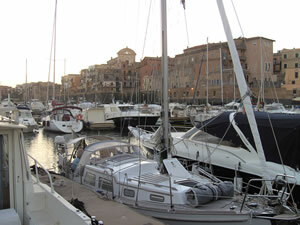 The ormeggiatori of Anzio advice us to try to get a berth in Nettuno marina, despite the works. Kaat calls the harbour on VHF and ... gets without problems a berth! We have heard many time that there was no berthing possibility and that visitors were unfriendly chased away. E-mails on MyCA confirmed the experiences! At Porto Turistico di Roma Kaat got some information about the Nettuno- problems from the - friendly - Guardia Finanza; they called Nettuno and confirmed the problems too. But ... we'll go to Nettuno according the advice we get in Anzio! At the entrance we understand immediately the situation: there are very big extension works, a lot more than what's given up in our Pilot. The entrance and outer harbour have already their new configuration - a smaller copy of Porto turistico di Roma -, but in the ( new ) first part of the marina we see many cranes at work, concrete pouring, - dangerous steels for the reinforced concrete are visible on the new walls -, a new, rather small, basin: it's zigzagging that we go to our berth carrying out the instructions of the harbormaster. He is not unfriendly, but he speaks only Italian. Our berth is just near the office-tower and the sanitary block, comfortable ... and rather quiet! But we want to understand more about the problems here. At the Agency Sailing Yachts, where we have to pay, we hear that the problem in fact is that most of the ormeggiatori-staff is speaking only Italian and that submerged by questions they cannot answer, they react nervously, what's understood by the disappointed visitor as "chasing away"! Believe who want to believe it ... Kaat mentioned also the many critics, the e-mails ... Will it help? For so many times we see the importance of an effective communication and of knowing languages when cruising: we are happy with our answer to the known linguistic weakness of the Italians, we think that's this is the best working solution: so thank you Patrizia in Menton, our Italian teacher, (see Kortom, Menton), and thanks "to each of the two of us" ... to have had the perseverance to work hardly a whole year in our Assimil-Italian manual! A short visit to the old town, a pleasant terrace, some provisions and a brief walk on the Lungomare: Nettuno isn't, anymore, a unknown town! 20.06.08 From Nettuno to Gaeta. We decide to go faster to the South than planned: the bad weather has caused enough delay. So, we'll not make a stop at the islands of Ponza and Ventotene. Today we'll sail to Gaeta. : 50 NM, departure at 06.30a.m., course 130°, flat see, wind (ap.) 060° 9 knots. East of Nettuno there is a firing range and when there are exercices boats have to remain 7NM offshore. Yesterday the boat of the Guardia Finanza - they are here the "guard" - called us asking after our intentions. They told us that we have to be out of the sector at 8 a.m.: so, if we leave Nettuno before 7 a.m. it should be OK ( we had to hold this conversation in Italian too !). About this firing range there is no indication on our different charts, and we got no message on the NAVTEX ( see also Rod Heikell's Pilot). 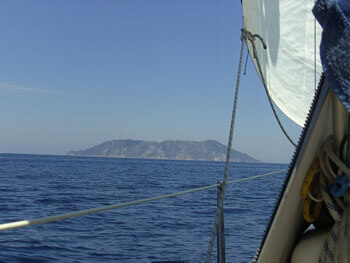 At 10.30 a.m. we are at 5 NM from Capo Circeo. We have furled our high aspect jib because the wind is coming in at 010° now. At 11.30 a.m. we are passing under this mythic cape and we take the time to read again some small parts of Homers' Odyssey ! But faster than the Greek hero from Ithaka we find the way to escape! Behind the cape the pleasant San Felice di Circeo - a small and crowded harbour but a possibility in case of problems. A little later - Terracina is at 5 miles - when a small but fast ferryboat is coming at our starboard. Kaat calls him to inform about his intentions but we get no reply. Fortunately he alters little his course! The coast is now at 6 NM. Most of the time we are alone in an empty sea, but a rare sailing boat, a few fishing boats, or a motor yacht making uncomfortable waves, the only one permanent presence is ... this of many plastic bags! At 16.10 p.m. we enter the large Rada di Gaeta. The Base Nautico Flavio Gioia is just in the north of it behind an important navy base where a big warship lies behind a big floating barrier. At 16.45 we berth, after exactly 49,5 NM on the GPS. It's Friday evening and the weekend is coming: if we want to avoid the rush to the Flegree isole ( Phlegraean Islands ) in the NW of the Golfo di Napoli, it should be better to stay one day more in Gaeta. The town is pleasant with lively little streets, San Erasmo at the Punta di Gaeta is charming, and the view over the bay with the high and dry mountains is magnificent! 22.06.08 From Gaeta to Isola d'Ischia. 06H45. 25°C. Less wind is forecasted, so we will cross to the islands Ischia and Procida - 35 NM - ... again motoring, despite we can for a short time unfurl the jib. 11 a.m. Still 15 NM to Ischia. On starboard at 2,5 NM, the Concordia - a Contrast 33 Danish - of Niels and Janne; we met them at Avignon, they wintered in Barcelona, and suddenly in Rome, they appear! They left Gaeta after us, but our small sailing boat keeps it at an average of 4,5 to 5 knots so they could easily catch up. Our underwater hull needs also some maintenance; perhaps we will get the hull cleaned in Tropea. 12 o'clock, a little more wind, we unfurl the jib, but we keep the engine running, because there is too less wind. 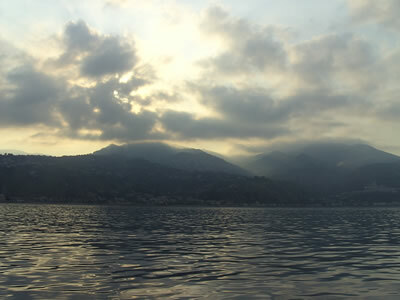 23.06.08 From Isola d'Ischia to Amalfi. 7 o'clock. After a short night we leave the anchorage. 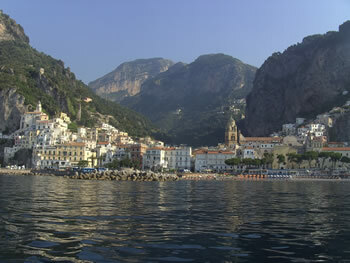 We want to reach Amalfi, sailing along the very beautiful Costa Amalfitana, many time mentioned in our Italian manuel. We have to sail 3O NM, first with the Isola di Procida at our port, then in the direction of the Isola di Capri and the Punta Campanella - the cross of the Golfo di Napoli - and later on, along the marine reserve of the very small Li Galli islands, to Positano and the charming small harbour of Amalfi. Amalfi. The place is hypertouristic but the arrival is so magnificent that we forget the tourists! Some pontoons behind the small jetty are kept by a few little agencies. We phoned for a berth to the agency of Giulio Coppola and on arrival at 2 p.m. he comes on board and, a few minutes later he "puts our boat" - to use his words - on the pontoon with much dexterity: a personalised service, as he says, but in our meaning, a way to avoid problems in this small but charming harbour! 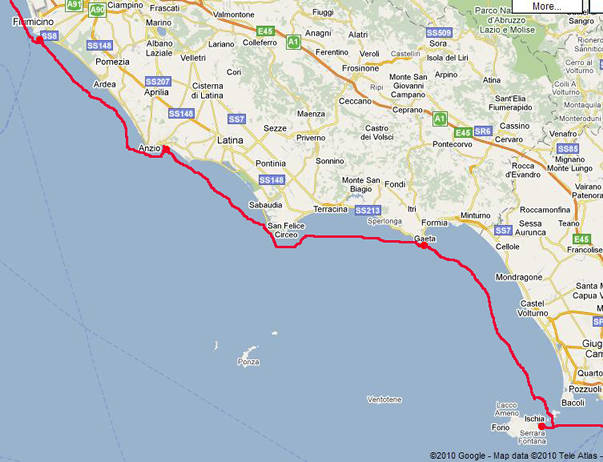 24.06.08 From Amalfi to Agropoli. Giulio appears not in time and, because we had to pay domani , today we start our trip little later, what is not to please us. .
At 8.30 a.m. we take our last picture of Amalfi. 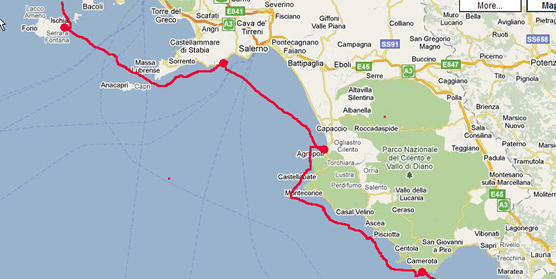 It's 26 NM from Amalfi to Agropoli at the other side of the Golfo di Salerno. Again we have a flat sea, less wind, variable - at first mainly E -, later on W.
At 12.30 we arrive at the free-quay in the harbour of Agropoli. We have to use our anchor: there are no laid moorings here! Agropoli is a small and nice spot - there are a few boats on transit -, but it's a little bit a place of nowhere, wasn't it that ancient Paestum is nearby. 25.06.08 Fro Agropoli to Camerota. 35 miles, variable wind 4-10 knots: a quiet trip along a nice coast. The country-side is green and pleasant; fields and small villages succeeding each other. 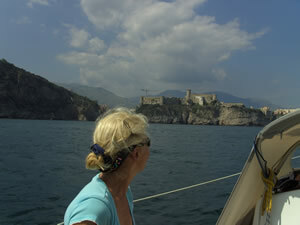 : this is the coast of Campania seen from 0,5 NM on our boat, sailing on a nice calm and blue sea. We have put two conspicuous waypoints into the router: one at the Punta Licosa, the other at cape Capo Palinuro . We have left Agropoli at 7 a.m. and at 1.45 p.m. we berth in the small harbour of Camerota - the fishing harbour is along the S wall and our berthing pontoon in the La Marina de il Leone di Caprera is on the NW side. Camerota is a small and lively place but nothing more, nicely situated at 5 NM on the SE of Capo Palinuro where some caves should be an attraction for visitors. Here also we are one of the scarce stranger boats. That we are in the South of Italy we see it also on our thermometer: at 10 p.m. this evening it's still 27°C ! This will perhaps explain the concentration of ice cream saloons : we couldn't resist to the temptation of savouring a ice-cream at the Pasticeria e gelateria Napolitana, well known here since a long time and situated just above the harbour! 26.06.08 From Camerota to Cetraro. In exactly 7 hours we sail the 36 NM from Camerota to Cetraro, motoring and under main sail, sometimes we can unfurl our foresail. In the sky some clouds are appearing, the humidity is increasing and the visibility is decreasing. Is this the harbinger of a weather change and the end on the scorching heat? The harbour of Cetraro [update 2013: http://www.portocetraro.it/ new marina] lies nicely in the hinterland: green hills and dry the summits. Leaving the harbour you'll find a place of nowhere: the village is at least at 30' walk. We are alongside the free quay, with five other sailing boats. The owner of a small restaurant a little further makes comings and goings: he's trying to sell his services and to draw customers. His services are limited - taking the lines and giving some evident information - but he maintains that he can provide some help for all problems. For his "services" he asks, skilfully, a price depending of the length of the boat ! Mostly people do not discuss - and so we do! Is this swindle? The attitudes and the testimony differ, also on internet: this is an old story and the man has now a kind of some reputation ! Reputation of vileness or particular ambiguous concern, very typical for the south of Italy? This evening we will go to the restaurant of this man who's mixing sympathetic traits and a too big interest for money; but after the conversation about his now " well-known services ", he seems a bit worrying about it. Francesco Vaccaro is the owner of the restaurant-pizzeria Gambero Rosso the only one in the vicinity of the harbour. We will eat very well: an antipasti of octopus and mussels (cooked! ), una prima of ravioli stuffed with tuna (Kaat) and an insalata mista (Eric), for secunda, gambas and a steak of grilled swordfish, a fresh white wine della casa and to finish a lemon ice-sorbet. In the small restaurant, a few tables are taken, one by three nice Italians traveling from Nettuno to the Eolian Islands by their Grand Soleil 43. We are reassured by their presence here: it's a kind of quality label ! In a little we are speaking with them, exchanging experiences and - for us very interesting - information. But ... it's above all a new and pleasant possibility to practice our Italian speaking and to be corrected! 26.06.08 From Cetraro to Tropea. 16.30:Porto di Tropea Little surprised we tie up at our berth: the smallest sailing boat in this rather new harbour has for neighbour one of the most famous luxury sailing yachts in Italy: de Puritan. At 06.30 a.m. we have left Cetraro to follow exactly a course to the South and gradually we have loosed the view to the coastline. 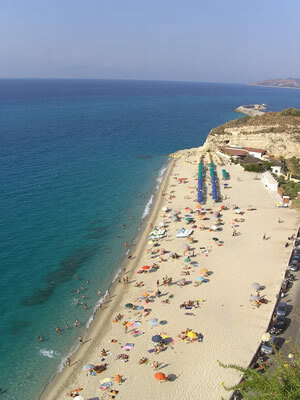 The forecasted thunderstorms have disappeared this morning from the weather forecasts: Calabria will be spared! We started under variable cloudiness, passed some hours under a little dark and treating sky and finished our trip in sunny and blue conditions. 10 hours of close to the wind sailing, with just enough wind to let our high aspect foresail to contribute to increase our progression; despite our fouled underwater hull we had an average of 5 knots - sometimes we had 6 knots - ... with the engine at 2/3 of his max. power ! Now that we are arrived in Tropea we want to take care of the boat - the last days there was a lack of time due to the succession of sailing days. Kaat has already phoned with the shipyard: they will clean our hull on Monday! 01.07.08 Tropea. Yesterday, we had a whole day "boat-maintenance": the hull has been cleaned with the high pressure by the shipyard and the propeller got the adequate attention. We have serviced the engine for the third time of our trip, hoping that this should keep the engine in good condition. Our stop at Tropea allows us to complete our provisions and to fill up with diesel. 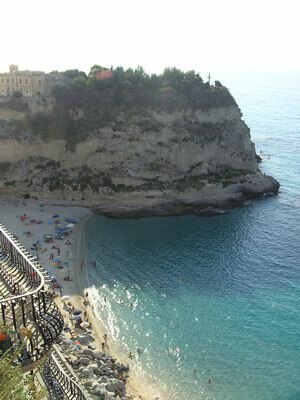 After two discovering walks we think that Tropea is a nice place for a longer stay. We enjoy also a beach-day and the nice water temperature is an irresistible invitation! 02.07.08 From Tropea to Reggio (di) Calabria. 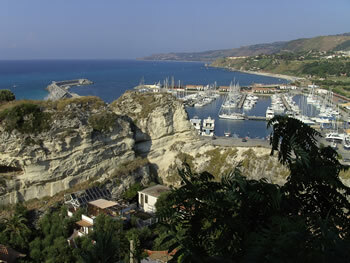 At 06.30 a.m. we leave the nice Porto di Ullisse of Tropea. For the first time of our trip we have made current calculations. The Strait of Messina is not only a very busy passage: it's also famous - and in the past it was dreaded - for his current and his swirls and eddies. The choice for Charybdis was for the seamen of the mythical times even dramatic: some of Odysseus' team were devoured by the dogs of Scilla. Expressions in our modern languages are still testifying about this tragic dilemma [ Between Scylla and Charybdis ]. For us things are more prosaic: the S-going current starts at 04H30 after HW Gibraltar off of Punta Pezzo. At starboard big ships are appearing now, they have to follow the TSS of the Stretto di Messina ( instituted by Italy but non-recognised by the IMO ). We have also to pay attention to the ships going to the commercial harbour of Gioia Tauroz - one is just passed in front of us - and also to the fishing boats - principally they witch are fishing swordfish - of Bagnara Calabra and of Scilla; " keep a good look out": so our radar is always watching. All this remember us our cruising trips to Great-Britain, our crossings of the access channels to the main harbours of the North sea and the Channel. But there is one difference: here, near the radar display it's 34°C. 11H35. 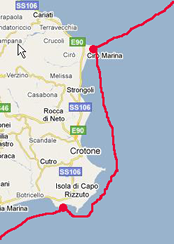 Scilla is at our port; we are following the coastline in the ( virtual ) Inshore traffic zone. The current allows us to progress with a speed over the ground of 6,7 kts. 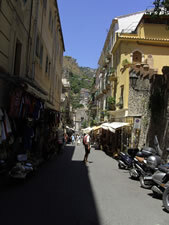 The Street of Messina begins at Capo Peloro, on the other side, in Sicily: it's also the most narrow part. 12H15: we have a SOG 8,6 kts at Punta Pezzo where is situated the harbour of Villa San Giovanni. The traffic of the ferries is intensive and it's important that we keep our course: the situation is here confused and we do not want to make it worse. At 13H40 we enter the harbour of Reggio Calabria, and ten minutes later we are fixing our mooring lines, imitated in this by the Concordia. The small harbour for yachts is immediately on the left in the ferry harbour, behind the red light on the small jetty. Between the express road, the ferry harbour and the harbour road, this is not a very quiet berth but there is no real alternative. 03.07.08 From Reggio (di) Calabria to ... Riposto, Sicily. 06H00. We prepare our departure. Today is an uneven day so we set battery "1". No current. Nothing. Dead. At that moment we understand that we have to replace the both parallel connected batteries. Fortunately, yesterday, Kaat had found a battery shop , "only, in case of ...". At 8 a.m. we stay before the closed shutters. At 8.32 a.m. when this nice shop opens we know that we'll have to wait till 10H30 to get our new batteries: one and a half hour is the minimum required charge time for the new batteries, witch are stocked dry. The owner himself is in charge of us and invites us for breakfast in a nice bar nearby. When he is leaving us on the harbour with our new batteries we think to be able to fix the problem quickly. But when connecting one of the batteries the cable breaks off on the fitting of the engine side: a small part that not had been replaced when the new engine was installed, two and a half years ago. A new loss of time. 12H30 We leave Reggio, tired and stressed. With our new batteries, we are on the way for ... Sicily! To late for the 63 NM to Rocella Ionica. We couldn't stay longer at Reggio because the visitors berths are mainly the berths of the charter company Spartivento and the boats are coming back, so no more place ! The ferry harbour seems us not to be a nice option and we have some doubt about the weather. 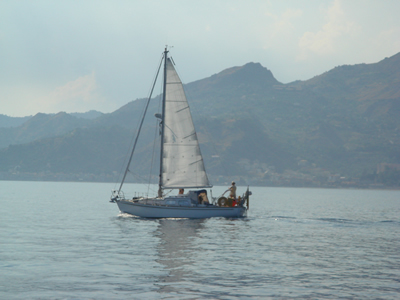 So we decide to sail to Riposto, just south of Taormina. 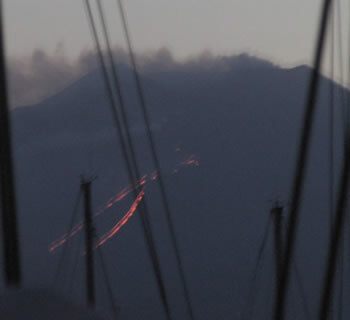 There we'll see the Etna and the trip to Rocella will be only 8 NM longer. If we have to make our stop longer, it would be at a nice place! Back to Messina or Tropea, passing again the Strait of Messina seems not very sensible! 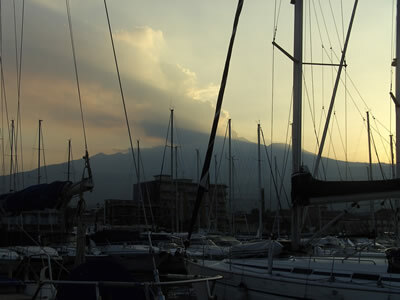 18H30 We tie up in the Porto dell' Etna. Kaat has called the harbour before we left Reggio. 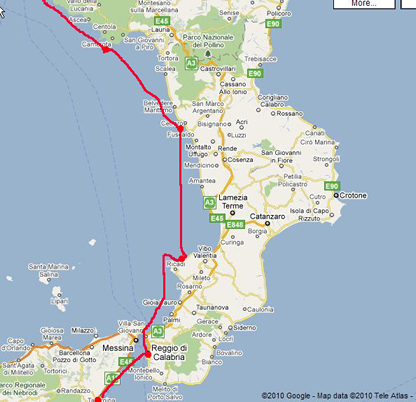 We have sailed the 36 NM in six hours, and discovered a small part of the Sicilian coast. Taormina witch is requiring our admiration lies on the foot of the Etna volcano and is overlooking the sea, about 7 NM north of Riposto. . When in evening the Etna will appear out of the mist we have a impressive view on the more than 3000m high fire spitting monster: the whole night two lava-steams visible from our cockpit will redden the sides of the mountain. 06.07.08 Riposto. Yesterday we have visited Taormina. From the Teatro Greco - the ancient theater built by the Greek colonists in the III rd cent. B.C. 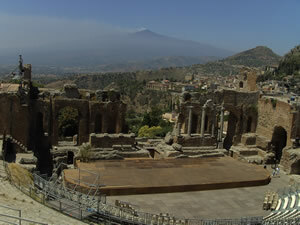 and transformed by the Romans - we have a splendid view to the Etna and the whole coast. Our walk through the main street - the Corso Umberto - is taking us to the three ancient town-gates, to the piazza del Duomo and the cathedral. 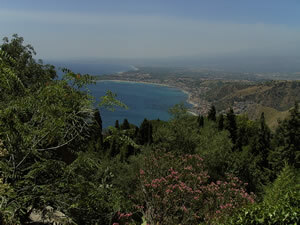 From the piazza 9 Aprile we have - again - a nice panoramic view over the Golfo di Taormina. From Riposto - the station is at 15' from the harbour - it takes 20' by train to reach the nice old station of Taormina from where we go up to the town centre in 10'. 06.07.08 Riposto is a rather dusty town - the Etna dust is part of the atmosphere - with a fishing harbour which now is transformed into a pleasant marina. The sea front also should be renovated but in Italy and in Sicily in particular, planning is a concept little empty of signification. After a walk through Riposto it seems that urbanisation and building maintenance are not part of the usual vocabulary! 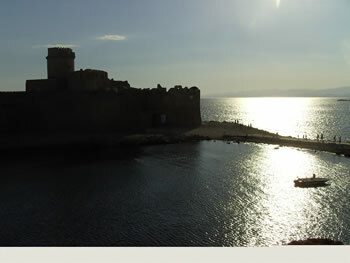 Riposto, is a forgotten past, a part of deep-Sicily which is suddenly confronted by the marina to the XXI th century. And Porto dell'Etna is extending, the works should be finished in November: so the berthing capacity will be doubled by this new public harbour, well situated with the fascinating Etna on the background, offering good facilities, an excellent welcome and perfect services. There are two disadvantages: the innumerable plastic bags floating in the harbour - the visible evidence of lack of ecological awareness -, and, the swell due to the endless ballet of the dinghies by the marina staff, when speed is limited at 2 kts. But they have an excuse: they are continuously called to assist Italian boats at every mooring manoeuvre - common in Italy, and for us, the evident sign of a to be served mentality and .. the evidence of poor know how and knowledge! 07.07.08 From Riposto, Sicily, to Rocella Ionica, SE-Calabria. 05H15. We leave Porto dell'Etna. 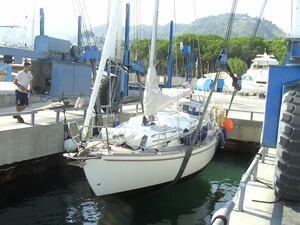 A trip of 73 NM to Rocella Ionica in the "sole" of Italy. The Ionian Sea is like a mirror. 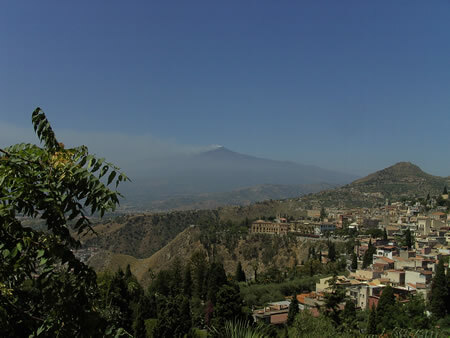 The Etna spits his with ashes loaded smoke cloud. 12H50, we have Capo Spartivento at 1NM on port. The wind is freshening when we set our course to the NE. 13H30 We are under reefed mainsail, our High aspect jib is completely unfurled and the engine is at 2/3 of his max. power; SOG 6 kts. 16H00 Kaat calls the Guardia Costiera of Rocella to inform them about our arrival and to ask a berth; they control the public part of the harbour and sailors of Riposto have advised us to communicate our ETA. 18H30 We arrive at Rocella: we have prepared our approach with care because the entrance is silting and we have to make a large curve to enter - there are no buoys - and to take the centre of the narrow channel. The Coast Guard man in white uniform is making big signs: four boats have entered and the berth allocation is a little confused. Finally we get a nice berth regarding the condition of the harbour: alongside a half down smashed catway on the E wall. Our Danish friends are less lucky: their nice Contrast 33 is rather low for the concrete quay. Kaat negotiate with Guardia Costiera.so that they can come alongside our boat. Rocella is the only one harbour between Reggio or Riposto and Le Castella or the important but not very pleasant harbour of Crotone (Saline Joniche is to be avoided for security reasons and its access!). Although the spot is green and not unpleasant, the absence of facilities and equipments - except a restaurant -, and the six kilometres to the small town make from the harbour of Rocella Ionica a not so ideal stop! 08.07.08 From Rocella Ionica to Le Castella. 06H00. With six other boats - the flotilla is now very international! - we leave Rocella Ionica. Till Punta Stilo (08H00) we get less wind: a light morning breeze is caressing the flat sea. The weather forecast announces NW 15 kts at Punta Stilo, then in the afternoon at Capo Colonne there should be a 10 kts S wind. 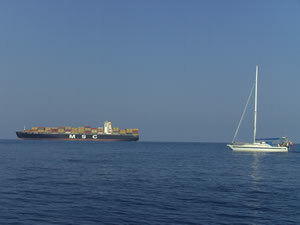 When we have passed Punta Stilo, we see that one of the sailing boats that is preceding us, is seriously hanging over. while we reef - immediately - the mainsail, we feel how we go through a heat barrier. The wind deviation at Punta Stilo, the associated acceleration and the high morning temperatures produce a sudden increasing of the wind: our anemometer indicates constantly 24 kts. Regarding the wind we will cross the 36 NM of the Golfo di Squillace in two times: first, a few nautical miles after Punta Stilo, with little easing wind -our course is 035°, wind (ap.) 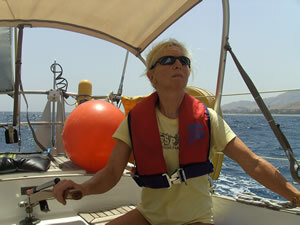 055° 15-18kts; the second situation, from 13H00, with a real upwarming and the wind (ap.) 070-055°, 20-27kts. We go to Le Castella, mentioned as charming. This morning - about 10 a.m. - Kaat has called the Lega Navale: there are not a lot of possibilities but after she had a little insisted - in Italian! - she obtains a positive answer. When at 2.20 p.m. we can distinguish - but not so clearly - the harbour entrance from the coastline, the see has build up and we understand that there will be no place for errors: the entrance is small and open to the N behind the little S-jetty which is open to the E; under the natural N jetty, there are many submerged rocks. Entering shall be done coming from the E and keeping well the middle of the channel. We have already furled our high aspect jib but we will lower our main during the very short entering manoeuvre: at that moment we will be shortly in the wind and a little protected by the S wall. According the indications of the man from the Lega navale, we will have to wait in the first basin - the small fishing harbour - immediately on the left. In the afternoon, after the siesta - "Al'pomeriggio" - when the small office will open again, we will get a berth. At 4.30 p.m.we moore at the darsena turistico, alongside a local sailing boat. Le Castella is a pleasant touristic resort: the Castello which is giving its name to the village and the bay are participating to the charm. Some hotels and flats are the evidence of the efforts to the touristic development. The proximity of the maritime reserve of Capo Rizzuto should be an asset: two diving centres and three tourist boats with transparent bottom are waiting for customers, with some success. We got a nice welcome in the small harbour where limited works show the will to improve things. Our dinner at the nice restaurant La Scogliera - built between rocks and sea - is excellent! 11.07.08 From Le Castella to Ciro Marina. 7H30 We are on the way to Ciro Marina: we want to avoid Crotone - with his not really pleasant reputation. A stop at the new harbour of Ciro Marina, although not finished, situated 2NM before Punta Alice, will make our cross-trip of the Golfo di Taranto to Santa Maria di Leuca 10 NM shorter. 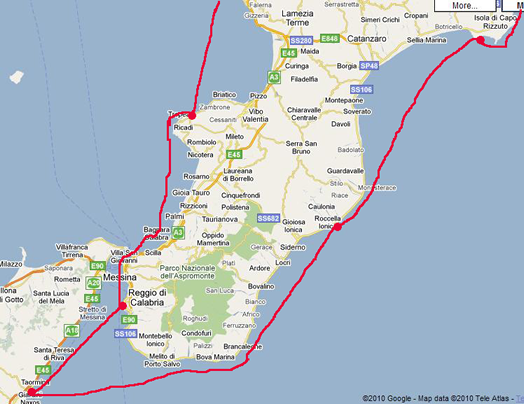 So, we have to sail 36 NM along a rather monotonous Calabrian coast. We have to avoid the A-areas of the two maritime reserves on our way: they are marked by in our Pilot mentioned buoys but the positions are little different. Off Crotone there are four gas platforms: we have to stay out of their vicinity. Here we will get our first incident with a local. The new harbour is already very damaged and there is no management and a lack of space. It's difficult to find a berth between the small local boats and the fishing boats. The new quay is high and damaged, the access not so easy. There are a few pontoons, deeper in the harbour but with less of water. 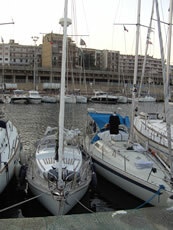 Two sailing boats are moored at the quay, no other space. One seems to be a 36 ' charter boat from Velazzurro - no team, no owner. Concordia goes first alongside, then we. The Seefest from Finland goes alongside a small fishing boat; they are assisted by the owner of the other Italian boat, and someone else. Kaat has called yesterday the president of the local Lega Navale; he told her to go alongside where possible, we should get water at the Lega. Suddenly a man appears: he's very angry and is removing our mooring lines: there should be no space in the harbour for strangers - a French boat has stolen his fenders - and for him all no-Italians have to go. The friendly people who have helped us, are now angry too; so, because the man is very aggressive and we are in Calabria, we decide to anchor just behind the entrance after trying to explain without succes that we are unknown about all this and that we only want to stay here till tomorrow. On the anchorage Kaat calls the Guardia Costiera by the emergency phone number 1530, and she calls also the president of the local Le ga Naval. After a time - we were just thinking that we were forgotten - the director of the Guardia Costlier from Croton calls Ka at back. For him what happened is unacceptable, he will send someone of his Service in Cairo. Half an hour later an agent of the Guardia Costlier appears. He is inquiring about our situation, gives some possibilities, asks if we need something. We prefer to stay in the outer harbour because we don't want to make it worse. Before he leaves he gives us an 24/24H emergency call number. 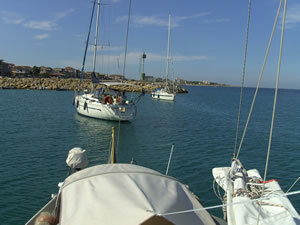 12.07.08 From Ciro Marina to Santa Maria di Leuca. 05H10 We leave Ciro Marina, " rich of a poor experience "! 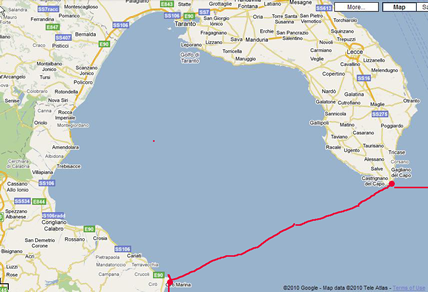 The coast disappears quickly: we start the cross of the Golfo di Taranto, 62 NM, to Santa Maria di Leuca. It's hot and the little southerly wind brings not much coolness. 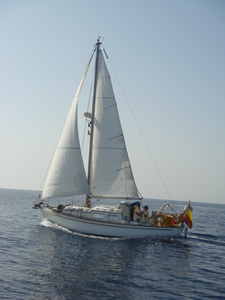 We are motor-sailing, with mainsail and High Aspect jib: CC 065°, SOG 5,5 kts. At 1.52 p.m. we call a tanker who's coming with high speed on port: he will not answer but when we give our position he alters his course and his bow wave disappears. 2.45 p.m. Santa Maria di Leuca is at 10 NM. The Gulf of Taranto is the play garden of submarines: the depth reaches here 1970 m. From the NAVTEX messages we know that there are exercises now. Our paper chart mentions the two areas used for exercises. Our course follows at 1 NM over 14 NM the SSE limit of the area. But no sign of exercises! At 4.30 p.m. we moore in the harbour of Santa Maria di Leuca. It will be the most unquiet and most rolling berth: the swell is not created by the sea and the southerly wind but by small boats: it's Saturday and many people are continuously passing at a crazy speed ... the Italian holidays are not far away! And later on, during the night, it's the sea that makes uncomfortable! 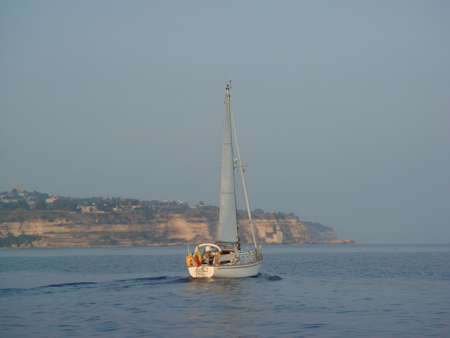 13.07.08 From Santa Maria di Leuca, Italy, to Corfu, Greece. After a very agitated and short night - the second one ! - we go for the "big" and since so long expected cross. The weather forecast is uncertain: for this afternoon much wind is announced for the Italian coast of the Ionian Sea; rather heavy winds also for Monday and Tuesday, but northerly. For the Greek coast strong winds of the North for the night from Monday to Tuesday, the prevailing winds are here in the summer NW-ly. For our cross today: freshening winds from S/SE for the part W of 019°E, for the region E of 019°E in the morning W 10 kts, from midday S-SE 10 kts, then SW, and in Corfu Strait between the island and Albania the wind will probably be N till the evening and then SE. The choice is easy: or we go today or we will have to stay many days in the uncomfortable harbour of Leuca. So we leave at 5.30 a.m.
At 10 a.m. we are half a way between Italy and the first Greek island - Nisis Othonoi, the S-anchorage common used by crossing to Greece. From Leuca to N.Othonoi 47,5 NM (course 087°), to Gouvia 36,5 NM more. Our speed is 5,5 kts (av. 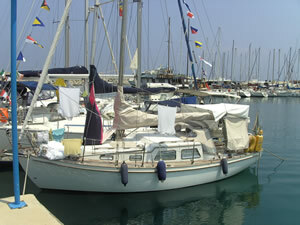 ), under mainsail, and high aspect jib and the engine at 2/3 max. power. When we have at 2 p.m. N.Othonoi on port the decision is already taken: the S-ly wind is not an invitation to anchor in the bay and the N-side of the island is not an option. Depending the situation we will or anchor at Kassiopi or we will continue to Gouvia. Finally it will be the second possibility: since one hour - it's about four in the afternoon - we seem to have with us the influence of the rests of the N going current on the W-side of the island - about one knot. 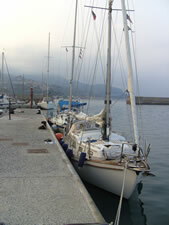 The N-ly wind makes anchoring at Kassiopi, Kalami or Agios Stefanos not so pleasant. The night is falling when we enter Gouvia Marina, navigation lights on: it's 8.30 p.m. boat time, 9.30 p.m. local - Greek! - time. We have realised an important part of our dream: this night Nehalinnia is berthing in Greece!